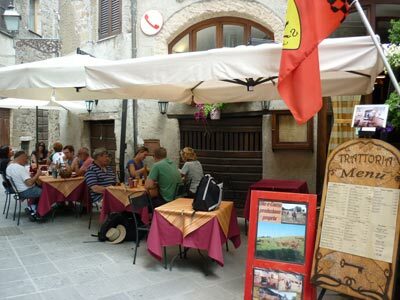 A Pitigliano restaurant recommendation. 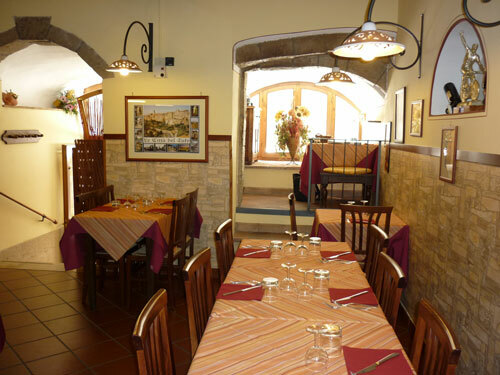 There are a dozen "ristoranti a Pitigliano" in which to eat out in in the spectacular town of Pitigliano Italy, but this one is a recommendation of a resident artist I met while exploring this extraordinary place in Maremma. 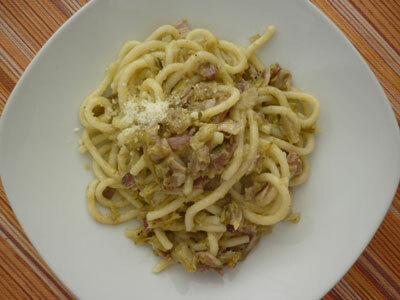 My requirements for lunch were a simple plate of home-cooked pasta - nothing fancy with more decoration than substance! - and he recommended two places near the Chiesa di San. Rocco (the church of San Rocco or Santa Maria). Trattoria La Chiave del Paradiso was the first of the two I came upon after leaving his workshop in the Piazza A. Becherini in Capisotto, the western-most and oldest part of Pitigliano, and heading back into the town. NOTE: the piazza has fabulous not to be missed views over the merging green valleys of the Lente and the Meleta and the Santuario della Madonna delle Grazie on the hillside opposite. The menu looked nice and straightforward, with prices less than others I had seen for the same typical Maremman dishes in other restaurants in the town, but what convined me to give it a try was the huge smile and warm welcome of the owner as he saw me reading the menu. And the fact that all of the meat and olive oil that they use in the restaurant is their own farm produce - "olio extravergine di oliva e carne produzione propria". By the way, their olive oil is great with a less intense and peppery flavour than our own in Maremma. There are covered tables outside if you like to eat al fresco - which all of the tourists eating there that day decided to do - but I opted to eat in the cooler environment of indoors (with the locals). To give you an idea of prices, the antipasti range from €3,50 to €8,00, the primi piatti from €6,00 to €7,50, the secondi piatti from to €5,50 to €15,00 with the steaks priced as is usual in Italy by weight in kilos, the contorni from €2.50 to €3,50, the dolce from €3,50 to €4,00, and the tourist menu was €17,50. The bread and cover charge is €1,50. I opted for a light lunch as I was planning to explore the awe inspiring local Vie Cave afterwards and so chose the house pasta dish of Pici del Paradiso with a tasty combination of artichokes and smoked bacon (at €7,50). Perfect. The Chiave del Paradiso is closed on Mondays.